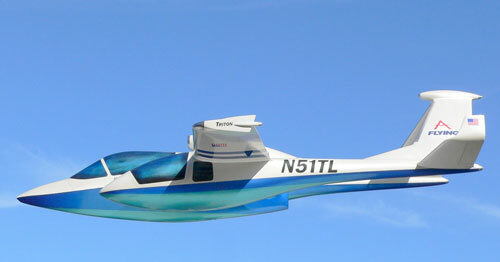 The Triton gives 3-5 passengers panoramic views and . . .
up to 20 minutes of near silent flight over noise sensitive areas. With the number of pilots that will be learning their trade from military service steadily decreasing over the next decade, an aircraft needs to be made that will have the everyday person on the street say “I want to fly in that!” The popularity of amusement park rides and computer games that simulate flight verifies that the desire to fly is still alive and well in the human race. The Triton will provide 3-5 passengers panoramic views and luxury car-like accommodations in a fighter jet-like environment that sitting in the back seat of today’s average GA aircraft just can’t provide. Most people who experience flying in a Triton will feel the magic of flight and want more, with many being inspired to work toward becoming a pilot. 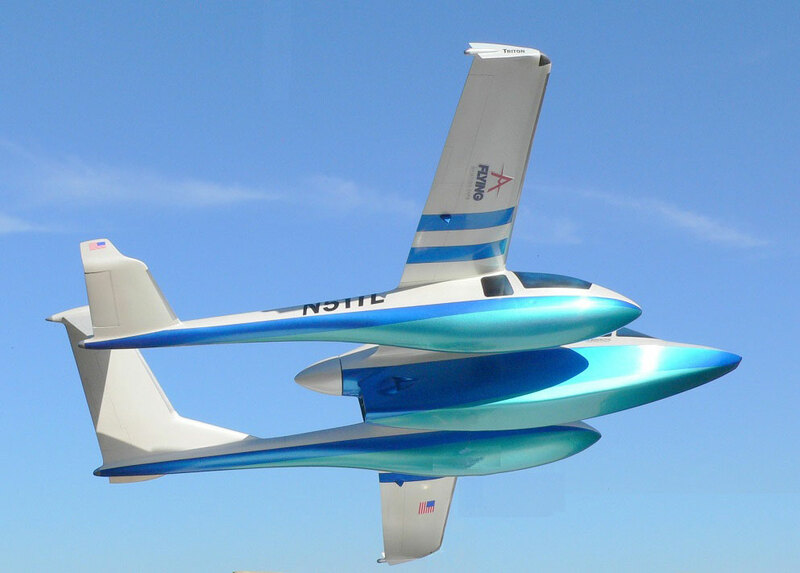 The 42’ wingspan Triton will be powered by a 450 hp pusher turboprop for reduced noise, with advanced versions combining this with electric hybrid power that, with today’s battery technology, will provide up to 20 minutes of near silent flight over noise sensitive areas. This will make the Triton the aircraft of choice for sightseeing operations. 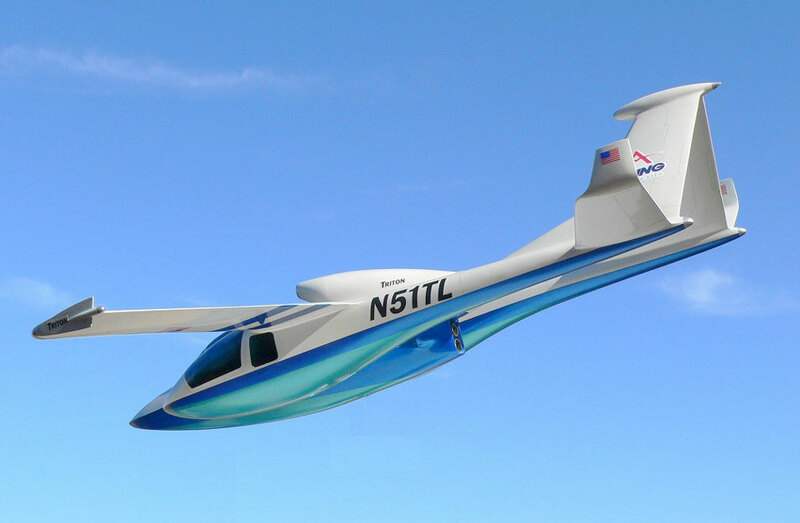 Its Ballistic Recovery System, while sacrificing some higher performance figures, will end up being the deciding factor in many average individual’s decision whether or not to take their first ride in a smaller aircraft. 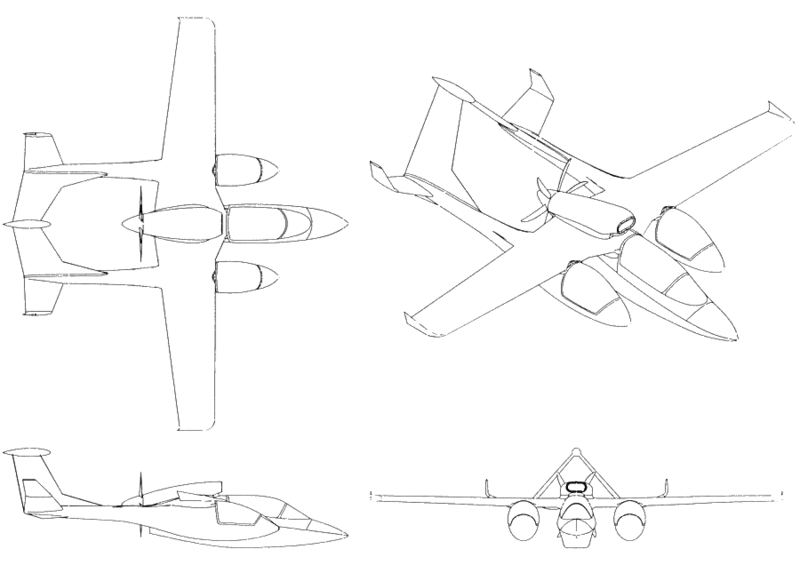 The Triton uses an innovative, yet not radical, aerodynamic layout. 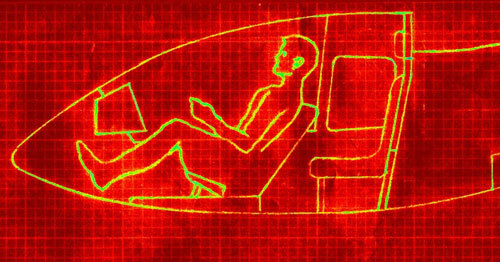 No technological breakthroughs are necessary to insure its success. Practical solutions have been incorporated into the design of the Triton to deal with the problem of balance and CG control caused by varied passenger loads. 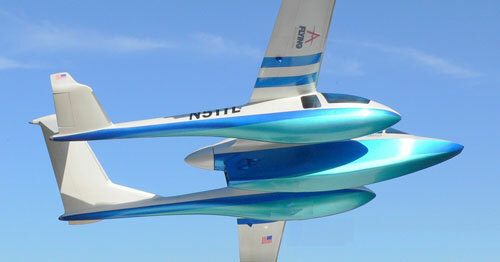 Split control surfaces on the outer double-V tail can act as air brakes and enhance yaw control. 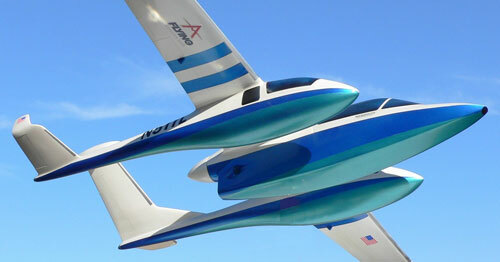 There is one reaction that is common to everyone who has seen the Triton: “It’s a beautiful aircraft”. Pilots truly want their passengers to enjoy their flight as much as the person in command of the aircraft. The Triton will produce this result. It seems that almost all the recent General & Business Aviation projects that are on the drawing board or in prototype form are pursuing the same narrow markets. How many different 6-8 place single or twin engine passenger jets and turboprops are needed in the current business climate, or even in a prospering one? Others pursue speed and range above everything else. By focusing on the quality of the flight experience that passengers will have when flying in the Triton, and the safety and comfort they will feel, the Triton will help to improve public understanding and perception of General Aviation. This will lead to the creation of many profitable businesses, and help fill the pipeline of pilots that the aviation community desperately needs. 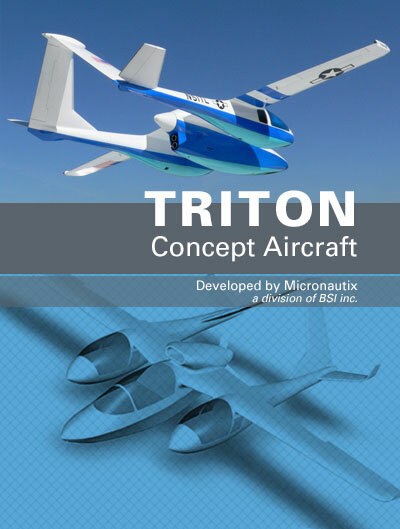 The near term goal for the Triton is to find an established aerospace firm that believes in the potential the aircraft has so that their engineers can make the Triton a reality. Micronautix has no illusions about doing that on its own, even if financing and the $60+ million for obtaining certification were not an issue. Having a positive impact on the future of general aviation within the next five years and creating a product that can help revitalize general aviation worldwide is the primary focus. The success of an inanimate object that is designed to inspire humans may be hard to measure, but from the current responses we have received from the non-aviation minded public, the Triton’s success will be obvious. 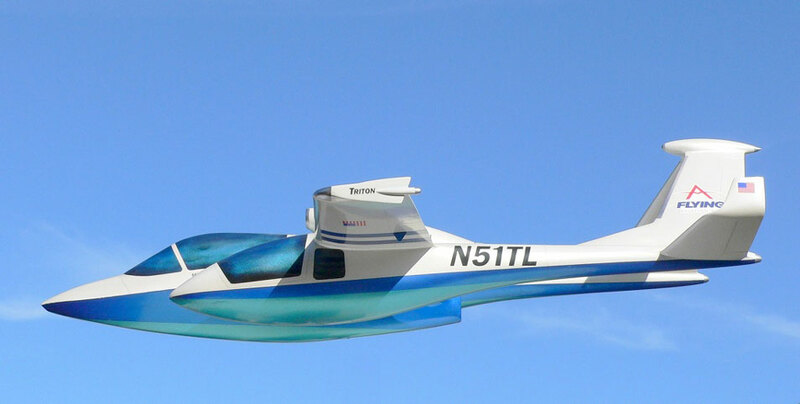 Aerial sightseeing will be revitalized by Tritons flying over Hawaii, the Grand Canyon, wine countries, coastal areas and many other attractions around the world. 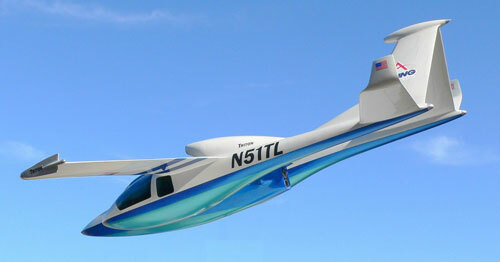 People will be flying in the Triton for the simple enjoyment of flight, an experience that is very rare these days. 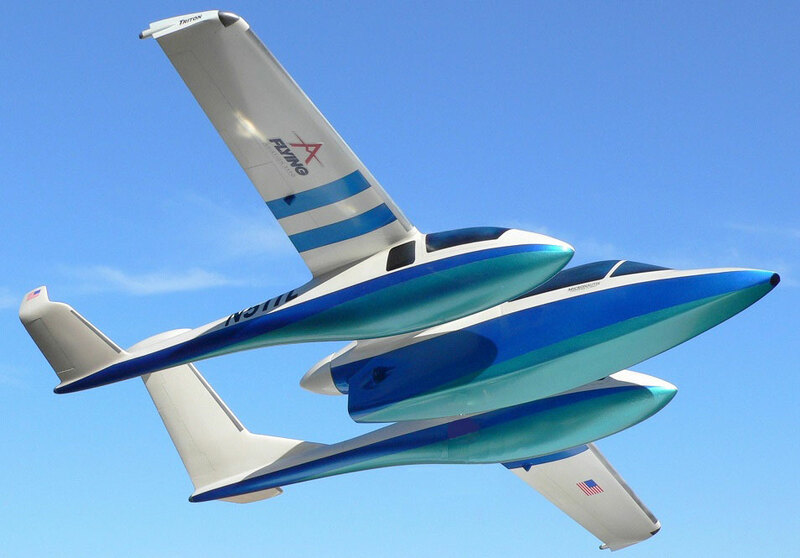 The Triton is an aircraft concept that prioritizes passenger comfort, view and their trust in safely experiencing the magic of flight. 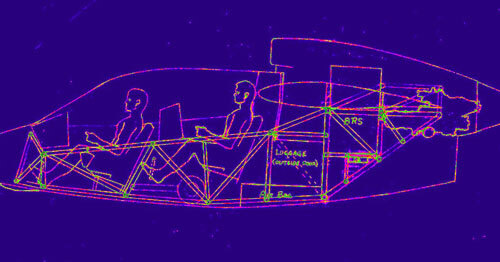 It is a 4-6 place Flight Experience Aircraft Powered by a Rolls-Royce M250-B17F/2 turboprop.